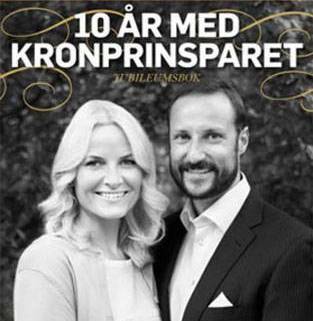 Crown Prince Haakon and Crown Princess Mette-Marit, née Høiby, will celebrate their 10th wedding anniversary on 25 August 2011. 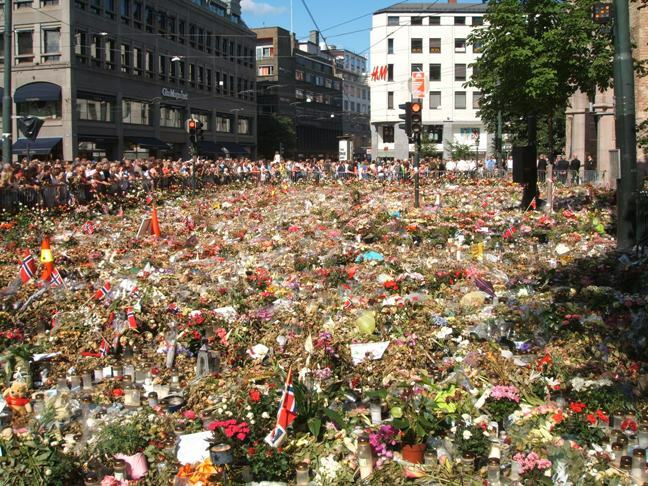 The occasion will be marked by a church service in Oslo Domkirke (Oslo Cathedral) on Thursday 25 August at 3 p.m. I have so far noted 3 books that have been or will be published in connection with the anniversary. 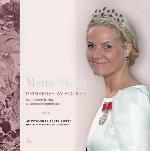 The first one is titled Mette-Marit. Prinsesse av folket ("Mette-Marit. The people's princess") and is published by Kagge Forlag. It is described as "an illustrated celebration of Norway's Crown Prince couple", with photographs by Aasta Børte, while the Hjemmet journalist Monica Aafløy Hansen has written the texts. The book is originally priced at NOK 399, but Libris sells it for NOK 349. No mentioning of the title at the publisher's own website, though (I just made a search). ISBN: 9788248911074. Aller Media AS has recently published 10 år med Kronprinsparet. Jubileumsbok ("10 years with the Crown Prince couple. An anniversary book"). I can't find any BibSys registration, but according to the publiser's website the 140 pages' long book is priced at NOK 149 for those who subscribe to one of Aller Media's periodicals. It can also be purchased in one of the Narvesen kiosks (price NOK 179). 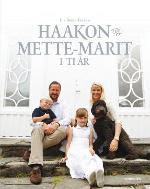 The Aftenposten journalist and former court reporter Liv Berit Tjessem has written the book Haakon og Mette-Marit i 10 år ("10 years with Haakon and Mette-Marit"). It is published by Schibsted Forlag and will be available for purchase on 25 August 2011. According to the Norli bookstore it is priced at NOK 199, while BibSys operates with the price NOK 299 (and even with a slightly different book title, Kronprinsparet gjennom 10 år!). No information at the publisher's website so far, but the ISBN is 9788251656306. It should be added that I have not read any of the (photo) books yet, but had a very short look into Børte/Hansen's illustrated celebration book and it looked rather nice. Postscript 7 August 2011: Liv Berit Tessem's book Haakon og Mette-Marit i 10 år is now available in the bookstores (and the supermarkets). At Norli's website I was earlier told that the book would first hit the market on the wedding day, 25 August, but this information has now been changed. The price is NOK 199. Again, I have not read the book, but it looked nice! 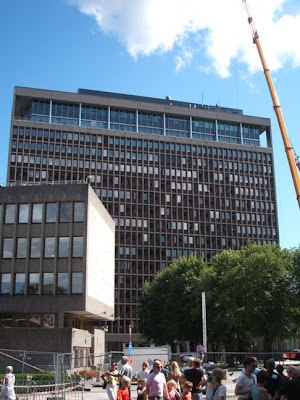 Updated on Monday 1 August 2011 at 08:25 (minor text additions), last time on Sunday 7 August 2011 at 08.00 (postscript). Zara Phillips, daughter of the Princess Royal (Princess Anne) and Mark Phillips, were married to Mike Tindall, son of Phillip Tindall and Linda Tindall, née Shepherd, at Canongate Kirk in Edinburgh yesterday, 30 July 2011. The wedding reception took place at Holyroodhouse. The Queen's declaration of consent to the marriage was given in the Pricy Council held on 10 May 2011. In attendance were among others the bride's grandparents, the Queen and the Duke of Edinburgh; the Princess Royal, Timothy Laurence, Captain Mark Phillips with spouse, Peter and Autumn Phillips, the Duke and Duchess of Rothesay, the Duke and Duchess of Cambridge, Prince Henry of Wales, the Duke of York, Princess Beatrix and Princess Eugenie of York, the Earl and Countess of Wessex, Andrew Parker Bowles (one of Zara Phillips' godparents), Iain Balshaw (best man), Dave Clark (boyfriend of Princess Beatrice) as well as Daniel and Lady Sarah Chatto (the latter the daughter of the late Princess Margaret). BBC News writes that Zara Phillips upon marriage will keep her maiden name, and that «it is understood this is because of her sporting career in equestrianism». Oh well, could it just be that she didn't see the point in changing the surname she has had her whole life? BBC News adds that Zara by not taking the surname of Mike Tindall «is believed to be setting a royal precedent». Maybe, but it is too early to tell. Source for guest list: Various news reports as well as the guest list section at Nobiliana.de. The flower garden outside Oslo Domkirke (Oslo Cathedral). 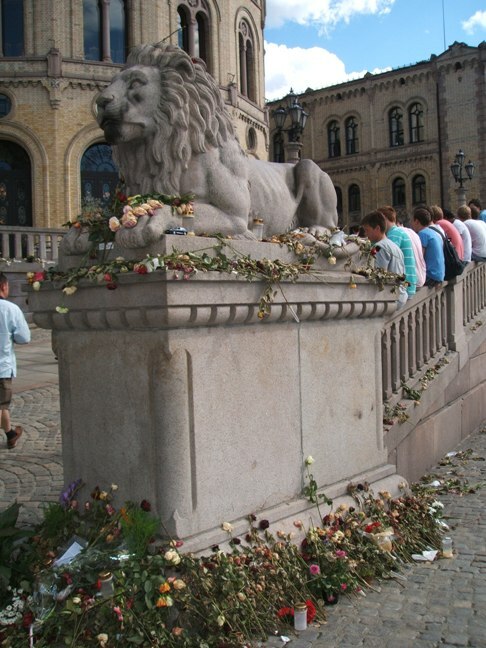 Outside the Storting (the Norwegian Parliament). In Akersgata, one of the roads that leads to the government offices. 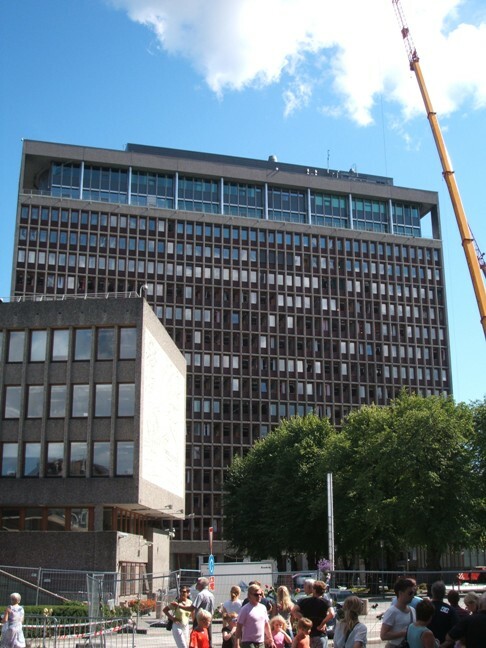 One of the government buildings, where the Prime Minister's Office and the Ministry of Justice and Police held office. 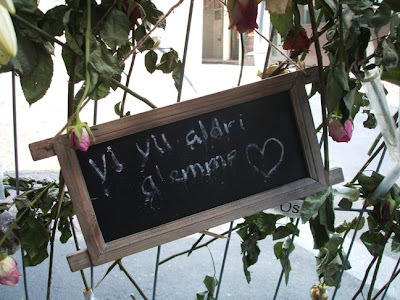 Late Friday night (29 July) I came home from a 3 weeks' long vacation to a capital very different from the one I left… The city I live in and love has got a scar it will take a long, long time to heal. The whole nation has got a scar. Norway is in mourning. 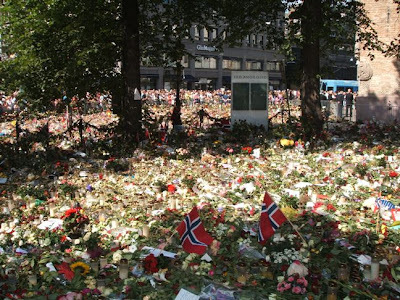 Yesterday I went with my family to downtown Oslo to see with my own eyes the damage the car bomb did to the government offices and surrounding areas on 22 July and to lay down flowers at the flower garden outside Oslo domkirke (Oslo Cathedral). A way of working through the shock and grief one feels after the 22 July terror acts in Oslo and at Utøya. The terror acts carried out by Anders Behring Breivik were targeted against the government of Norway and the Worker's Youth League's (AUF) summer camp at Utøya, but the whole nation was affected. It is almost impossible to add anything of substance to everything that has been written in forms of newspaper commentaries and blog articles as well as in the social media after the tragedy that struck our country. My heart goes out to the families and friends of the victims. 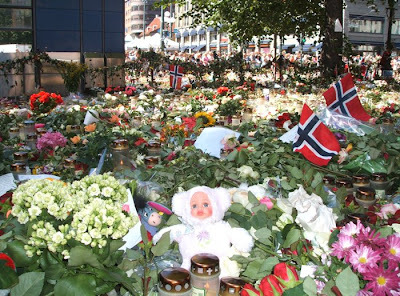 In the midst of this monstrous tragedy it has still been comforting to see how the Norwegian people have reacted in such a dignified manner – it has been wonderful to witness the unity and compassion the Norwegian have shown. It has been good to see true leadership carried out by the prime minister. And it has also been good to see how the royal family has shared the sorrow and grief of the people. 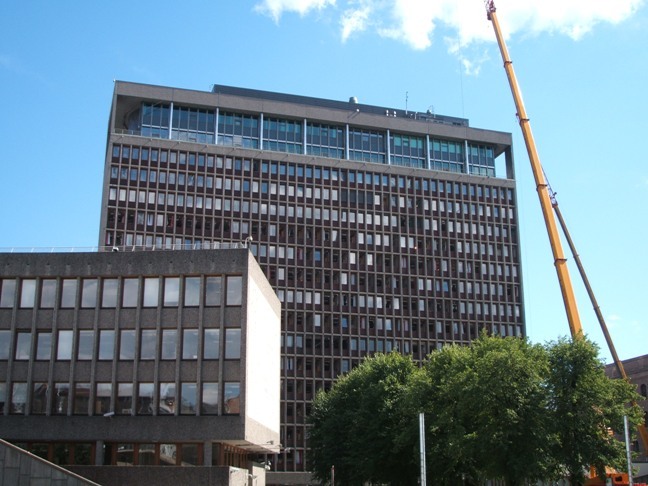 The royals have met the AUF members and the families of the victims at the temporary reception centre at Sundvolden Hotel, they have attended mourning services, visited hospitals, held speeches and appeals. But first of all they have offered a shoulder to cry on, shown empathy and compassion. 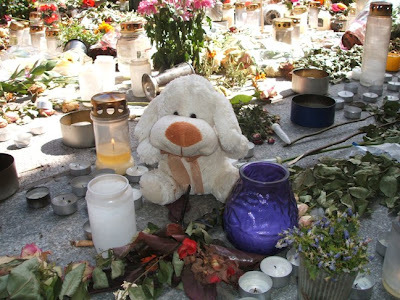 It has also been comforting to see how the whole world has expressed sympathy and shared our grief. In times like these we need to stand united shoulder to shoulder. 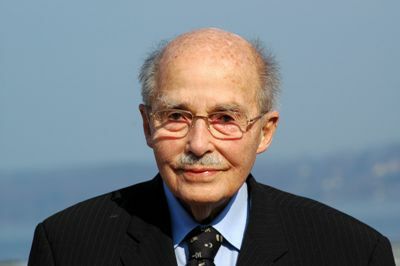 Otto von Habsburg (Archduke of Austria), the last Crown Prince of Austria and Hungary, died yesterday 4 July 2011 early in the morning, in his 99th year. Truly the end of an era. Ihre k. und k. Hoheit die durchlauchtigste Frau Erzherzogin Zita, Gemahlin Seiner k. und k. Hoheit der durchlauchtigsten Herrn Erzherzog Karl Franz Josef, ist Mittwoch, den 20. d. M., um 2 Uhr 40 Minuten früh in der Villa Wartholz bei Reichenau in Nieder-Österreich von einem Erzherzog glücklich entbunden worden. Das Allgemeinbefinden Ihrer k. und k. Hoheit ist den Umständen entsprechend. Der Kräftezustand ist normal, Temperatur 37.3, Puls 84. Der neugeborene Erzherzog ist gesund und kräftig. Reichenau in Nieder-Österreich, am 20. November 1912. Professor Dr. Beham. Dr. Bittner. The birth notice shouldn't be too difficult to understand. Her Imperial and Royal Highness Archduchess Zita, consort of His Imperial and Royal Highness Archduke Karl, gave birth to an Archduke at Villa Wartholz bei Reichenau, Lower Austria on Wednesday 20 November 1912, at 2.40 a.m.
Otto von Habsburg (Archduke Otto of Austria), former Crown Prince of Austria-Hungary and head of the Imperial House of Habsburg, born at Villa Wartholz bei Reichenau, Lower Austria 20 November 1912, died at Pöcking, Bavaria, Germany early in the morning of 4 July 2011, 98 years old. Otto was the oldest son of the last Emperor of Austria, Karl (1887-1916-1918-1922) and his wife Zita (1892-1989), née Princess of Bourbon-Parme. In 1951 the former Crown Prince married Princess Regina of Saxe-Meiningen (1925-2010). They had 7 children - Andrea (1953), Monika (1954), Michaela (1954), Gabriela (1956), Walburga (1958), Karl (1961) and Georg (1964). Archduke Karl took over as head of the Imperial House of Austria in 2007. Archduke Otto's obituary was published in The Daily Telegraph today, 4 July 2011. According to the late Archduke's website as well as Orf.at, the coffin "will rest for three days in the Church of St. Ulrich in Pöcking, Bavaria, while there is a pepetual adoration". Requiems will then be held in Pöcking (9 July), Munich (11 July), Mariazell (13 July), Vienna and Budapest. 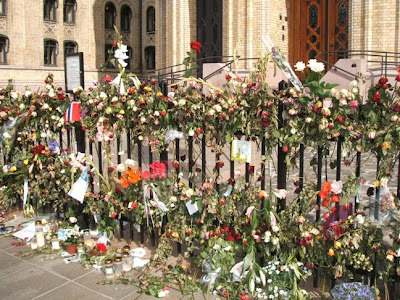 The funeral will take place in the Kapuzinergruft (Kaisergruft) following the requiem in St. Stephen's Cathedral on 16 July 2011. Archduke Otto's heart will then be buried at the Archabbey of Pannonhalma, Hungary (17 July). 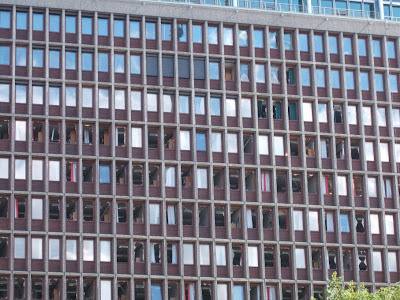 Updated on Tuesday 5 July 2011 at 23.00 (minor text change, link added). In connection with the ongoing visit of the Duke and Duchess of Cambridge to Canada, two new royal flags created by the Canadian Heraldic Authority and approved by HM Queen Elizabeth II, were unveiled. These new flags created for The Prince of Wales and The Duke of Cambridge are magnificent expressions of our constitutional monarchy and heritage. [...] As we prepare to welcome Their Royal Highnesses to experience this marvelous country, I am sure that many Canadians will take great interest in these new emblems. As head of the Canadian Heraldic Authority, I am delighted with the work of our Canadian heralds in preparing these designs. 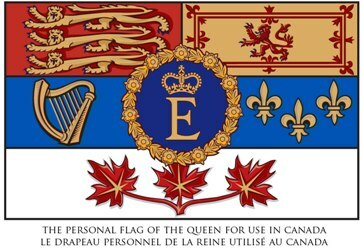 According to the information provided by the Office of the Governor General, the two new flags are based on HM The Queen's personal flag for use in Canada (image 3), which uses the Royal Arms of Canada as its basis. Since the flag was adopted in 1962, Her Majesty has been the only member to have a flag for use in Canada. According to the fact sheet on the personal flags presented this week, the designs were - as already stated - developed by the Canadian Heraldic Authority, "working with the households of Her Majesty The Queen, The Prince of Wales and The Duke of Cambridge". The personal heraldic flags are used during travelling in Canada. 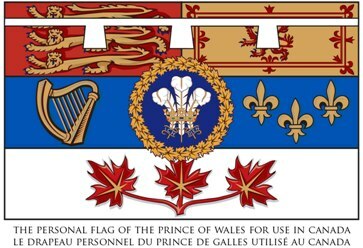 The new flag of the Prince of Wales (image 1) is described as follows: "The flag bears a blue roundel within a wreath of golden maple leaves for Canada. The centre features the badge commonly known as The Prince of Wales's feathers, used by the heir apparent to the Sovereign. Near the top of the flag is the traditional heraldic mark of an eldest male child, the three-point white label." 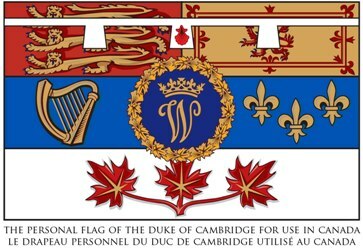 The new flag of the Duke of Cambridge (image 2): "The flag bears a blue roundel within a wreath of golden maple leaves for Canada, and of shells, a symbol borrowed from his coat of arms. The centre features his Cypher, composed of the letter "W" with a coronet above it that indicates he is the child of the heir apparent to the Sovereign. Near the top of the flag is the personal three-point white label charged with a red shell, taken from his coat of arms." The flag of HM The Queen (image 3): "The flag bears a blue roundel within a wreath of roses in gold. The centre features her Cypher, composed of the letter 'E' with the Royal Crown above it, also in gold." All the flags use the Royal Arms of Canada, in banner form, as their basis. HSH Prince Albert II of Monaco married Charlène Lynette Wittstock, daughter of Michael Wittstock and his wife Lynette, née Humberstone, in a civil ceremony in the Throne Room at the Prince's Palace on Friday 1 July 2011. The ceremony was officiated by Mr. Philippe Narmino, President of the Council of State and the Sovereign Family's civil registrar. Following the ceremony, the newly-wed couple greeted the people from the balcony of the Hall of Mirrors. The religious wedding took place in the Main Courtyard of the Prince's Palace on Saturday 2 July 2011. The Archbishop of Monaco, Bernard Barsi, celebrated the mass. A most beautiful ceremony attended by representatives of almost all the royal families of Europe as well an impressive number of celebrities. I will come back to the list soon, but would first like to say how impressed I was by how everything was carried out and the excellent service the information office at the Palace has provided. Even the order of presedence followed seemed to make sense, as opposed to the (also wonderful) British Royal Wedding in April this year. I watched parts of the ceremony on Swedish and Norwegian TV. I started with Swedish TV4, but when it took a commercial break, I switched to the Norwegian channel NRK1. On the latter you got the ceremonial program subtitled, which made all the difference, I would say. The Swedish commentators talked too much as well. After the wedding, the princely couple (funnily enough the Official Wedding Website says "the royal couple") left the Palace for Sainte Dévote's Church so that the Princess could lay down her wedding bouquet. I only saw parts of this on TV before I had to move on to other matters. The official dinner and the ball took place in the Opera Garnier and the Casino Terraces, concluded by a firework display at midnight. Shortly before the wedding weekend, the Princely Court published two guest lists with lots of biographical details - "Biographical Information of the Heads of State and other Official Personalities present at the Religious Wedding Ceremony July 2nd 2011" (pdf) and "Biographical Information of a Selection of Private Guests present at the Religious Wedding Ceremony July 2nd 2011" (pdf). Besides the bride and groom, HRH The Princess of Hanover (Princess Caroline), her children Andrea, Pierre and Charlotte Casiraghi as well as HRH Princess Alexandra of Hanover and also Princess Stephanie of Monaco and her children Louis Ducruet, Pauline Ducruet and Camille Gottlieb attended the wedding, as well as members of the late Princess Antoinette's family. Princess Caroline's husband Prince Ernst August was - quite understandably - not present, but his two sons Ernst August and Christian from his former marriage, were present. Members of Prince Albert's US American family was of course present, including his best man and cousin Chris Le Vine, and also members of the Wittstock family. Many of these friends might have attended with their partners, but for the most part they are not mentioned in the guest list. There was no representation from the Imperial Family of Japan, the Royal Family of Spain and the Royal Family of Romania. 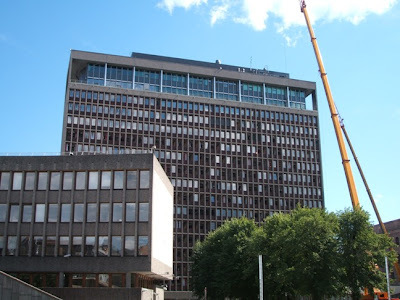 Updated on Wednesday 6 July 2011 at 23.00 (spelling of one name corrected), last time on Tuesday 2 August 2011 at 13.30 (see comments section).